So I was looking in TextMate for one of my most favorite tools from IntelliJ. It’s the “Compare with clipboard” action that takes whatever you have selected and runs a side-by-side diff with whatever is on your clipboard. I thought for sure it would exist in TextMate but I was disappointed so I built my own using Automator. See the pic below for the entire source. (There’s gotta be a better way to share Automator source but I’m in a hurry and lazy so there ya’ go.) This workflow depends on Xcode’s FileMerge but you can substitute whatever diff tool you’re comfortable with. 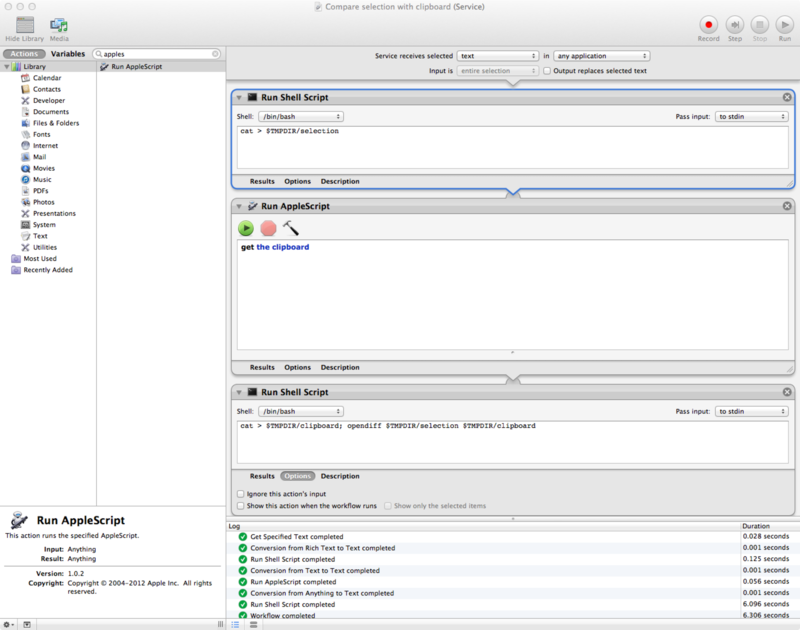 To create it, start Automator and select System service from the “New…” action then copy in the actions from the image. Name it “Compare selection with clipboard” and then where ever you are in your Mac you will have access to the tool from the context menu (right clicking) of any selection. When I first posted this there was a small bug. I changed the get clipboard step to an Applescript command “get the clipboard” since the built-in Automator task returns styled text instead of raw text.